Associated Church Press member, author, popular speaker and trainer, Christian Piatt, has released a new edition in his ‘Surviving the Bible’ series published by Fortress Press. 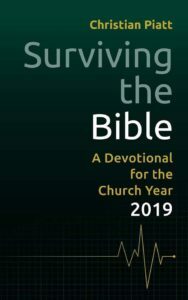 Surviving the Bible: A Devotional for the Church Year 2019 is now available in e-book and paperback formats. To request a review copy, please email Katie Clifford at CliffordK@fortresspress.com. Interview requests should be directed to the author at Christian.Piatt@squarecoremedia.com. Start anywhere. Set it down and come back to it. There’s no “wrong way” to use Surviving the Bible. Engage ancient texts in new ways that make sense, here and now, maybe for the first time. Any way you use it, it’s sure to challenge and inspire.